Saint Lucia's Day is the Church feast day dedicated to St. Lucy and is observed on December 13. It is celebrated mainly in Scandinavia, some countries in Europe, including Latvia. Even though it is not officially part of Advent, St Lucia’s day marks the beginning of Christmas season and it means bringing of hope and light. Lucia can be perceived as a symbol of the good forces in life and a symbol of light in the dark winter. Its mission is to bring light and goodness, which is related to the meaning of “Lucia” (in Latin “lux”, “lucis” – light). The Swedish Lucia celebration is an annual festival of medieval origin. The modern tradition of having public Lucia processions in the Swedish cities started in 1927. 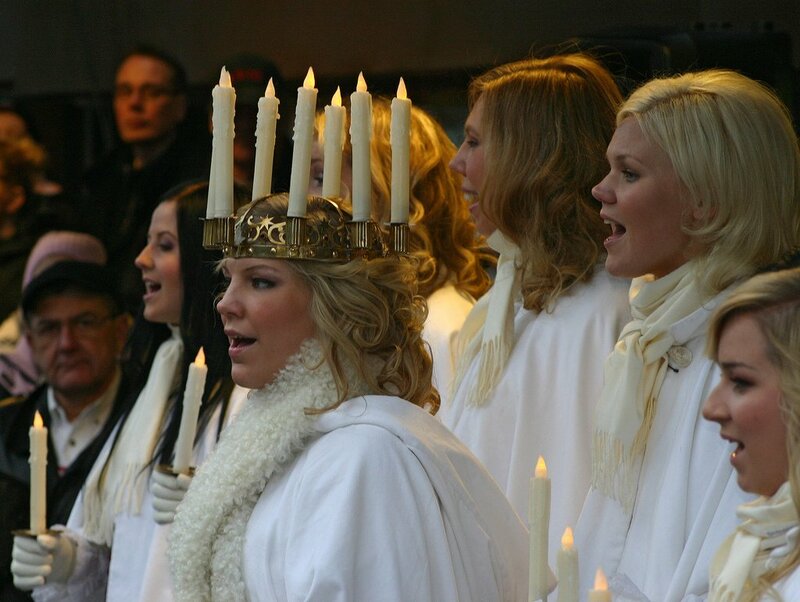 Today most cities in Sweden, schools, associations celebrates St.Lucia’s day by appoint its own Lucia every year. Lucia wearing a white gown with a red sash and a crown of candles (or lights) leads the Lucia’s procession followed by “sisters”. Inese Galante, a well known and recognized worldwide, Latvian soprano opera singer. Tālivaldis Deksnis started his musical career as a promising concert pianist in the seventies after graduating Latvian Academy of Music. At the same time he was deeply concerned with the condition of church organs in Latvia, thus becoming one of the few experts in organ building in Latvia. Ulf Samuelsson, Swedish conductor and organist. He established his choir called Sankta Eugenia Vokalensemble in September 2008. Nordea choir. Nordea choir was established on May 11th in 2009 when the most musical employees of Nordea bank gathered at the first rehearsal of Nordea choir. The choir is directed by talented, challenging and energetic conductor Janis Taranda. piccola chiesetta, che meraviglia .Buona giornata,Melania.